It was last May when I sent off fabric to the Always Bee Learning bee, including the link to Latifah Saafir's tutorial for half rectangle triangles. The print fabric was La Femme by Melissa Crawley for Kaufman from a fat-quarter bundle I'd won a while back. It had been waiting for just the right use, and the simplicity of hrt blocks seemed just the ticket. It's an Essex linen/cotton blend, and for the solid "background", I'd included American Made Brand solid in Light Cream. The fabric I sent each bee-mate was enough for 2 hrt pairs like those shown below, each block measuring 7x13" unfinished. My plan back then was simple scrappy rows of half rectangle triangles, like I'd seen others do. I liked the idea then and I like it now. Except that when I finally started putting all the blocks up on my design wall last week, I couldn't resist playing around with them, as I shared a few days ago. As soon as I put up the ziggity-zag layout (thanks to shadowsoftheblueridge for the nudge), I knew that was IT. 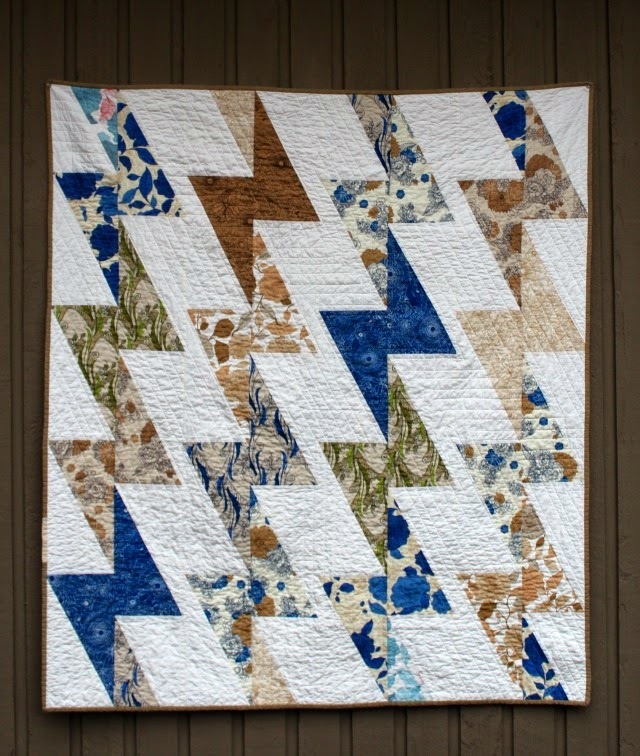 Though I think of the quilt orientation as being more horizontal, like the first photo in this post, it also looks pretty striking vertical. So you choose. For a backing, I used the few blocks that had pink and red in them, which gave me the fine opportunity to try a small sample of another hrt layout, which I like a lot too. Plus I improv-ed in all my leftover bits and bobs. To bring the back up to size, I added a row of Quilter's Linen (parchment?) there along the bottom. For quilting, I began with the somewhat centered blue "Z" as the focus, echoing around it in 2 directions at about 1" intervals. The resultant quilting made for quite the angle variety in different areas of the quilt, including some crosshatching now and then, all of which made me very happy. Though it wasn't till after a wash and dry that I'd realized I'd forgotten to go back and quilt inside the blue Z - so for now, it's left as is. 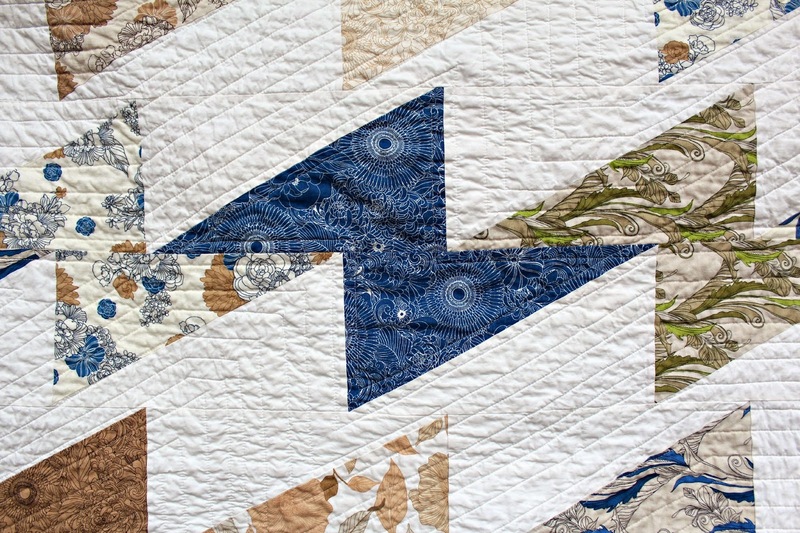 I had just enough of the Quilter's Linen to use as binding. Well except for the last little print scrap I felt compelled to insert. In the end, Ziggity-Zag measured 52"x60". So with this finish, I accomplish several notable milestones. Most timely is that this project was on my Q4 Finish-A-Long list, accomplished just in the nick of time. Second, these blocks were made by my bee-mates from the now obsolete Always Bee Learning bee. It was really important to me to honor my time with them by completing a quilt with the blocks we had made together. 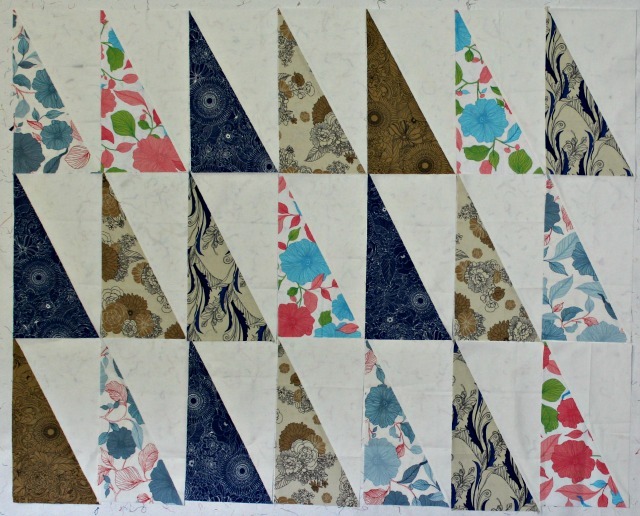 And lastly, creating these blocks and the resulting quilt was challenging yet satisfying, half rectangle triangles being a new technique in my toolbox, one I definitely hope to use again. Very cool, Debbie! It turned out beautifully! What size is it? Love this! A very successful finish indeed! I will have to give the HRT a try. Again, your quilting is the perfect complement! Thanks a lot....now I have one more major project on my table. The tutorial you shared is making those half rectangles sew up so easily. I love this. horizontally it's ziggity zag but when you turn it the lightening bolts appear. I love it, both sides, but especially the front. I am glad you were able to get these blocks finished into a quilt and I am glad to have been a part of it too. Love it. So simple and so beautiful!!! Love the bolts of lightning. I love how you use those simple blocks and did several different designs. Great Quilt Debbie and congrats on your finish! Gorgeous finish! Love how you walk us through your process. Will need to check out the tutorial. Congrats on the final finish! I really like the effect of the zig zag with rectangles instead of squares! And your color choice. Happy to be a teensy part of this terrific finish! Congrats on another fine quilt, Debbie!